Marco Rubio responds to Bootgate. The tweet that launched a thousand … uh, other tweets. 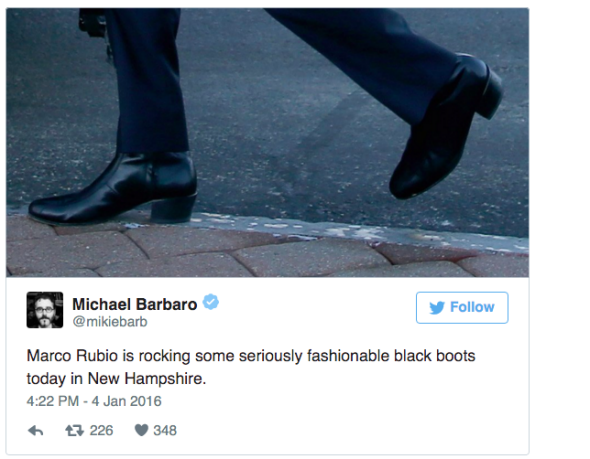 This week a great hue and kerfuffle has been raised by Marco Rubio’s Republican presidential rivals because, on Monday, a New York Times reporter photographed Rubio’s feet in a pair of shiny, somewhat flamboyant boots. (See above.) Such ostensibly “serious” candidates as Jeb Bush, Rand Paul, and Ted Cruz (or their representatives) all jumped in to laugh at how shiny, feminine, and European Rubio looked in his shiny girl-shoes. “So let me get this right. 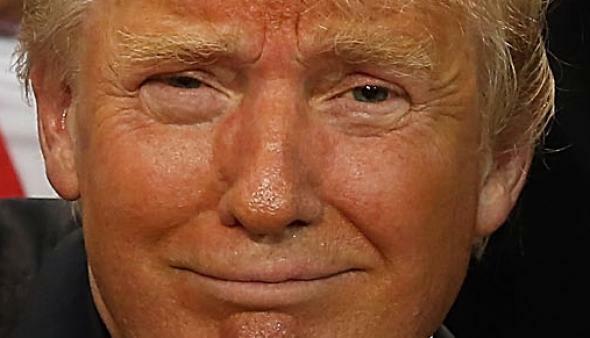 ISIS is cutting people’s heads off, setting people on fire in cages. Saudi Arabia and Iran are on the verge of a war,” he said, listing several more grave threats to the country’s safety and stability. And people were worked up about his boots, he asked, incredulous … The Florida senator said he had no idea that people were making such a fuss until his children told him on Wednesday night. First off, yeah right that you didn’t know about it until last night, Marco Rubio. You are surrounded 115 hours a day by people carrying smartphones whose only job and passion is to know instantaneously any time anything of any significance is said about you online. Your campaign told Politico what kind of boots you had on in the picture. (Florsheim.) If it took Marco Rubio a full 48 hours to find out that the New York Times and several of his opponents were talking about his boots I’ll eat my hat/boots. Second off, yeah right that you can’t believe that clothing would be a subject of discussion in an American presidential election, Marco Rubio. All our elections are dumb and in fact the question of whether a major-party presidential candidate dressed like a big wuss was a big issue only a few elections ago. Nothing is beneath the American political process.